Remember we wrote about how there are a few features which hotel review sites should include? We mentioned that by now, hotel review sites should at least enable reviews for how fast hotel wifis are, especially when we live in an increasingly digital world. Most hotels around the world now offer WiFi and Internet services to their guests. As we continue to advance in this highly technological world where the Internet powers most of our daily activities, from our scheduling; checking out the nearest eatery; finding the best prices for local attractions; or even contacting our loved ones, the speed of the Internet plays an important role in providing hotel guests with a pleasant experience. 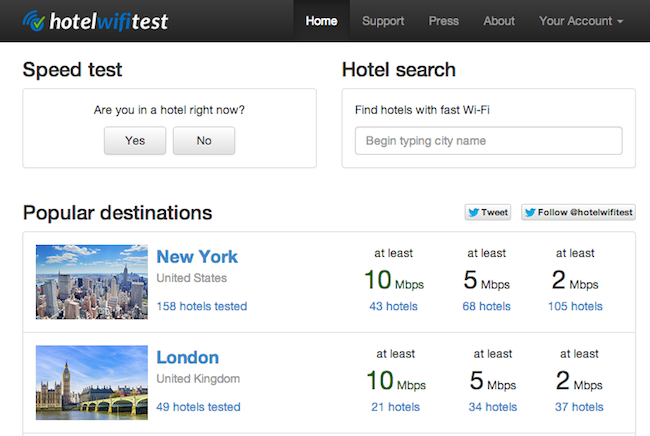 Turns out, a new dedicated site called Hotel WiFi Test has been set up to help just that. 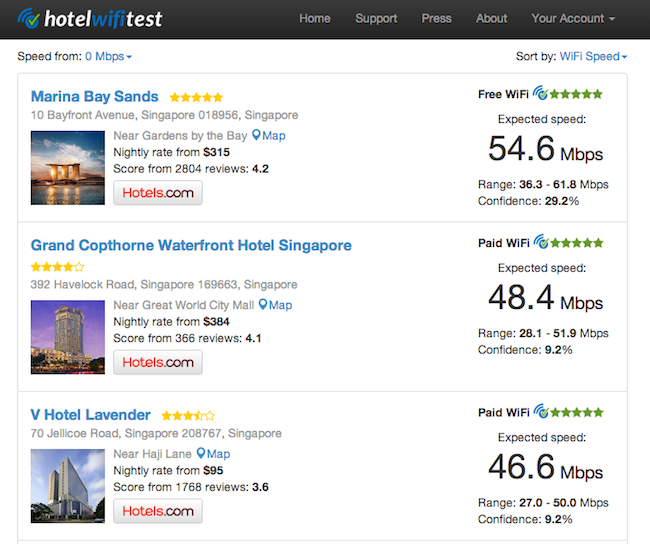 As its name suggest, Hotel WiFi test is a site that lets you find out the internet speed of hotels around the world. It relies on user generated content though: meaning users have to go to hotels and test the WiFi, simply by running the site and it will automatically pin down your location and run a speed test. After the website uses your internet location to check your approximate location, it shows you a list of hotels near you. You simply select the hotel you are in and the website will check your speed and figure the results into the rating. Currently, the website lists a few hundred tested site from popular locations around the world, and in Singapore, over 34 hotels have been tested for their WiFi speed at the time of this writing. Some of the hotels include Marina Bay Sands, which has the highest internet speed of all the hotels tested in Singapore, Grand Copthorne Waterfront, Shangri-La, The Fullerton and many more. Other than Singapore, 33 hotels in Bangkok have also been tested for their internet speed. Travel often? Packnada is your cool overseas wardrobe that packs itself! “We believe that when a hotel advertises free WiFi, they should provide travelers with a fast and reliable connection. Business travelers depend on the internet to stay connected to clients, remain in contact with the office, and to conduct meetings on the go. Recreational guests want fast WiFi for entertainment purposes, and for keeping in touch with family and friends.” – Hotel WIFi Speed test. The website also allows user to leave a venue tip on foursquare or tweet with mentioning the hotel’s Twitter account. So the next time you are at a hotel, you should definitely lend a hand in populating the list so that other travellers would know about the Internet speed of hotels around the world.